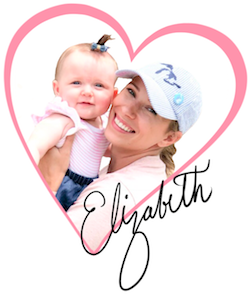 So happy to meet you, I’m Elizabeth. Thank you for stopping by to learn more about me and loveourlittles.com. The reason I started loveourlittles.com was truly out of love in the hopes I could help new moms and also satisfy the need I had to find an outlet for my creative side! A few months before I created this blog I became a military wife, moved to a new city (where I knew no one) and had my baby girl. A lot changed in my life and within a very short amount of time! I went from being self-employed as a hairstylist with two successful businesses to an “unemployed” stay at home mom. As you can imagine, I was a little lonely and extremely overwhelmed with my first baby and no family or friends near by to lean on. Some of the main pain points I experienced as a first time mom was breastfeeding, which is the reason that is a strong focus on loveourlittles.com. I had planned to nurse my baby exclusively, but after about four weeks of challenge after challenge and so much pain, I had to give up the hope of nursing. However, because of my stubborn nature, I found another way to give my baby her mother’s white liquid love. I became an exclusive pumper, and I honestly had no clue that’s what I was for quite some time. You see, exclusively pumping was not glorified in the media or even discussed with me during anytime of my pre or postnatal care. I don’t think I’ve ever even met anyone in real life who has pumped exclusively like me. Figuring out how to pump and be successful at it was a total game of will. I was frustrated, second-guessed myself all of the time and had so many set-backs, pain and talk about a learning curve. There really is no innate skill set women are born with that prepares them for breast pumping. If you are resonating with what I’m saying, please consider enrolling yourself into my e-course that I lovingly created to help moms eliminate some of the pumping pains I had to go through. The price is very reasonably set at $18 and there is loads of interactive information and advice. Here is the link to see the course curriculum. There is now no reason you should have to struggle with your supply, finding the right pump parts and learning how and when to replace them and so many more complications that come with exclusively pumping. You may still be determined to nurse and that is wonderful too! I strongly recommend you put some time into preparing for breastfeeding before your baby arrives. Another great video course that has helped thousands of moms ready themselves for breastfeeding success is The Ultimate Breastfeeding Class by Milkology. You can find all of my product and course suggestions on my recommendations page. As I expressed earlier, I created this blog to help other moms avoid some of the breastfeeding struggles I encountered and also to connect with my readers! Being a stay at home mom in a new city can be very lonely, but having you all here has made a world of difference in my life! Please connect personally with me on Instagram or Facebook and my email available down below as well. I always respond to any sincere form of communication. You can follow my accounts here and start connecting! Another place I’d love for you to follow me is on Pinterest!